Radionuclides offer a new paradigm in prostate cancer treatment. Try as they might to battle a cancer that affects many men, clinicians have been continually confronted with metastatic castrate-resistant prostate cancer (mCRPC). That means biochemical recurrence (BCR). "Significant advances have been made in the last decade, but survival remains poor, in the order of only several years," says Michael Hofman, MBBS, FRACP, FAANMS, a professor and nuclear medicine physician at the Centre for Cancer Imaging at the Peter MacCallum Cancer Centre in Melbourne, Australia. To combat that frustrating manifestation, researchers have advanced and clinicians are deploying a diagnostic/treatment approach involving radionuclide agents such as fluorine-18 (F-18), gallium-68 (Ga-68), and lutetium-177 (Lu-177), among others. In the United States, use of some agents are restricted, but the agent named Axumin is much more readily available—an advancement that pleases US urologists and nuclear medicine specialists. Recent studies provide evidence that the new approach can alter future treatment approaches. A phase 2 prospective study, conducted by Hofman and fellow researchers at the Peter MacCallum Cancer Centre, focused on prostate-specific membrane antigen (PSMA) imaging and the concept of theranostics—a highly precise medical approach that relies on diagnostic tests to image specific cancer development pathways but can also be used as a targeted therapy. "The ability to 'see what you treat' with theranostics is remarkable," Hofman explains. "This enables selection of patients most likely to benefit using whole-body PET scanning. It's very different from pharmacotherapies where the response in individual patients cannot be predicted upfront." The study involved patients whose options, via conventional therapies, seemed exhausted. Specifically, subjects with high PSMA-expression were administered Lu-PSMA617 (LuPSMA) therapy. "Our group has more than a decade of experience using lutetium-177 dotatate for treating metastatic neuroendocrine tumors," Hofman says, describing how the researchers proceeded in this new area of study. "We had the infrastructure and expertise to adapt this paradigm. Groups in Germany already provided this treatment as a compassionate access therapy, so early results around efficacy and toxicity were available. We elected to study this new technology rigorously." Resulting images tell the story. Indeed, at least one image was forceful enough to be selected as the SNMMI "Image of the Year" for 2018. What made the image so compelling was that it depicted significant response in the participating patient population after conventional treatments no longer proved viable in dealing with recurrence. Patients who received the therapy experienced improved quality of life. Furthermore, quality of life correlated with a profoundly noticeable reduction of prostate-specific antigen (PSA), a blood tumor marker that reveals either good or bad news. PSA level readings too often lead to physicians calling a patient back into the office for an emotionally painful consult. As Hofman relates, his group entered this direction of study after previous retrospective studies from Germany demonstrated high response rates related to Lu-177. The radiolabeled molecule binds strongly to PSMA, enabling delivery of high doses of radiation directly to tumors while sparing normal tissue. During the trial, 30 patients, from a field of 47 men with PSMA-avid mCRPC—those who had experienced treatment failure after undergoing standard treatment—received up to four cycles of LuPSMA every six weeks. Due to their efforts, the researchers concluded that "[this trial] provides evidence of high response rates, pain reduction, and low toxicity." "More than half of the patients who participated in the trial experienced a reduction in their PSA by over 50%," Hofman says. "This is a remarkable response rate for a cohort. These results broadly replicate the results from Germany and other parts of the world." To understand how this new paradigm was conceived and how it subsequently came into play, history provides perspective. Gerald Andriole, MD, chief of urologic surgery at Washington University School of Medicine in St. Louis, explains, "Following therapy, the earliest indication of recurrence is a PSA-level rise." That led to a dilemma. "When PSA rises, where is the specific area of recurrence? Could it be in the area wherein the prostate once resided? Or could it be in the pelvic lymph node? Or in the bones? Or somewhere else?" Andriole, who has deployed Axumin in practice, observes that conventional tests—X-ray, CT scan, conventional bone scans—were very intensive. He adds, however, that the tests proved revelatory. "They revealed the area of recurrence when it was too late for [efficacious] treatment." This was a problem, or at a least provocateur of troubling questions, he says, until recently. Axumin (fluciclovine F-18) injection, according to its manufacturer Blue Earth Diagnostics, is indicated for PET imaging in men with suspected prostate cancer recurrence based on elevated PSA levels following prior treatment. "Such an agent allowed us to identify—sooner than other available tests—specific location of recurrence," Andriole says. "It enabled us to subsequently administer better targeted treatment. We can see recurrence location and then eradicate it before it becomes a very large recurrence. That puts us much earlier in the game." Michael Kipper, MD, a nuclear medicine/internal medicine specialist with Genesis Healthcare in San Diego, one of the earliest users of the Axumin agent, provides additional historical perspective. "We had been in a situation where we had been looking for tests, using imaging technology, to find recurrence of prostate cancer at the earliest stage," he says. "Before availability of such agents, few [diagnostic] studies would find recurrence earlier. PSA would have had to have been at a very high number, before we would be able to find it with CT or bone scans or even regional MRI studies." With Axumin, Kipper says he can readily identify the subset of patients best served by additional treatment. "They've undergone primary treatment that involved the removal of the prostate or radiation delivered to the prostate," he says. As for whether the agent can enable clinicians to do something they could not previously do, or at least provide answers to previously unanswerable questions, he remarks, "It does indeed. Prostate cancer goes to three places: The most common place is bone, next is lymph nodes, and less commonly to organs in the body. Axumin enables us to look at the body from the top of the head and down to the knees." Axumin provides a couple of advantages when venturing into complex anatomical territory, he adds. "It's a whole-body survey," Kipper says. "It's not limited to just bone or soft tissue. It reveals abnormalities in any site and can find things earlier than other tests." 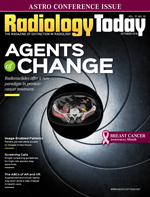 So does the new agent improve the capability of imaging technology such as PET, CT, and MRI? "It's an adjunct," Kipper emphasizes, providing additional perspective into how new agents figure into the total picture. "It doesn't necessarily enhance the capabilities of an MRI or CT. MRI is often used in conjunction with it and vice versa. For example, if we see an abnormality with the Axumin study, and we can't be 100% sure we're dealing with a metastasis, we will often get an MRI of that area, to see if that closes the case. Or if something is seen on the MRI, an area of enlargement that causes uncertainty, then we could go to an Axumin study; if something 'lights up,' then it is, indeed, a strong indication of metastasis. "Imaging and Axumin studies can be combined to determine a more specific diagnosis," Kipper says. He adds that the approach can potentially find a cure, rather than just keeping a lid on things until the disease spreads. "We are finding things earlier than we found them before," Kipper says. "Radiation oncologists will tell you that, once you get to a PSA above a certain level, your chance of curing the patient drops. If we can find these things with studies like Axumin and the PSA is at a certain level, we can keep the patient in a category where they can be cured, rather than having them in an area where we are treating and merely prolonging life." Kipper keeps a close eye on research advances and says there are similar agents being investigated. One is Ga-68. The other is a carbon-11 (C-11)-based imaging agent. He adds that C-11-based agents are only available in a few places in the United States, and patients usually pay cash for them. Also, Ga-68 can find abnormalities with even lower PSA levels than Axumin, but there are only a few places in the country where it's available. "Right now, Axumin seems to be taking the country by storm because it is more readily available, it is covered by insurance, and we can find things earlier than before," he says. "[Axumin] has the advantage of being widely available and covered by insurance, but the landscape is changing rapidly," Hofman says. "Axumin is an amino acid PET radiotracer and does not target PSMA. Newer gallium-68 or fluorinated-18 PSMA PET scans appear to be significantly superior." Studies on new agents are yielding promising results. For example, a study outlined in an abstract presented at SNMMI 2018 demonstrated the benefit of providing earlier Lu-177 PSMA radioligand therapy (Lu PRLT) to patients with metastatic prostate cancer. What made the study especially notable is that the researchers were not merely applying methodology to end-stage disease patients. The study included 224 patients with metastatic prostate cancer who were restaged following diagnosis with Ga-68 PSMA PET/CT. Patients were grouped according to previous therapies, which included surgery, chemotherapy, and external beam radiation therapy. PSA levels were monitored before and after therapy. Results revealed a reduction in PSA level in 70% of the patients treated with Lu PRLT, and 54% had their PSA decline by more than 50%. Another example is the results from the LOCATE trial. Andriole and Washington University were directly involved, on behalf of the LOCATE study group. "We evaluated the impact of the Axumin test [and how if figures into] making treatment decisions in patients who have recurrent prostate cancer," he says. "It involved about 213 patients." The trial was conducted between June 2016 and May 2017 at 15 sites across the United States. Eligible patients had prior curative-intent treatment of histologically confirmed prostate cancer and demonstrated suspected recurrence based on rising PSA levels. Also, the patients' cases revealed negative/equivocal findings on standard-of-care imaging. An 18F-fluciclovine PET/CT was performed according to standardized procedures. The primary endpoint was the proportion of patients with an altered treatment plan post PET/CT. Changes to treatment modality, eg, from salvage radiation therapy to systemic therapy, were classified as "major," while changes within a modality, eg, modified radiation therapy fields, were classified as "other." Overall, researchers detected 18F-fluciclovine-avid lesions in 57 patients. The detection rate was broadly proportional to the PSA level at the time of scanning. Imaging with 18F-fluciclovine PET/CT revealed one or more sites of disease recurrence in most men with BCR and frequently resulted in a change in management post scan. More than three-quarters of all management changes were considered "major." The researchers concluded that treatment based on presence or absence of 18F-fluciclovine-avid lesions "may facilitate more appropriate targeting of sites of recurrence and the avoidance of futile salvage therapy in men with suspected BCR of prostate cancer." Furthermore, the researchers indicated that investigation of the "long-term clinical outcomes of these changes is warranted." Additional—and significant—validation of the efficacy of such agents came from the National Comprehensive Cancer Network (NCCN). The organization added Axumin to its "Clinical Practice Guidelines in Oncology for Prostate Cancer (Version 1.2018)." The NCCN's updated guidelines say that "F-18 fluciclovine [PET/CT] or PET/MRI should be considered in the clinical workup of patients with recurrence or progression of their prostate cancer. This recommendation is based on uniform NCCN consensus that the intervention is appropriate." Meanwhile, in Australia, Hofman is conducting a large randomized study of PSMA PET compared with standard imaging in patients with newly diagnosed high-risk prostate cancer. In this patient cohort, if distant tumor spread is identified, it can save the patient from having a futile prostate operation. "We anticipate this study will provide the hard data government and insurance agencies need to make this test widely available," he says. While official validation from trial results is indeed gratifying, Kipper welcomes more research related to this new direction. "Right now, we're just scratching the surface," he says. "There is an ongoing need for more research. Many more agents are entering into the pipeline. Still, we have come a long way from what we had only a few years ago." Providing additional perspective from his own research/trial experience, Hofman comments, "This new form of therapy is likely to both improve quality of life and survival in men with metastatic disease. As a highly targeted therapy with high doses of radiation delivered to sites of tumors but only very low doses to normal tissues, treatment is well tolerated with few adverse effects. There's an urgent need to study this therapy earlier in the treatment paradigm of prostate cancer and in combination with other therapies."